There can be a stronger focus on relationship problems today, but with an eye on how to resolve them. People seem to be asking more provocative questions now. 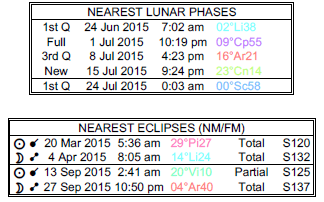 The Moon is in Virgo from 8:46 PM forward (until Tuesday, July 21st, at 9:21 AM). The Moon is waxing and in its New phase until 8:56 PM / the Moon is waxing and in its Waxing Crescent phase from 8:56 PM forward. 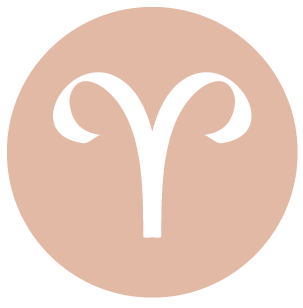 Today’s Mercury-Chiron trine can be best used by taking stock of what is and what isn’t working in your life, dear Aries. It’s also good for having conversations that help heal and repair the rough edges in a relationship. This influence facilitates pleasant solutions to problems, which tend to happen organically and naturally. It helps that you’re a little more patient and willing to take extra time to listen, absorb, and explain. Family and personal matters benefit the most. Forgiving others doesn’t have to be about them – it is a kindness to yourself as you let go of toxic emotions and begin to live your life more emotionally free. 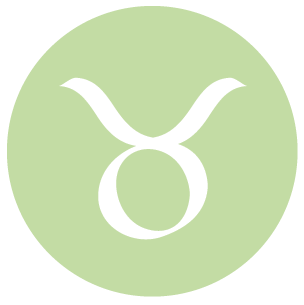 This is one of the better times for socializing, learning, connecting, and sharing, dear Taurus. There can be a lot to learn and teach now, and conversations tend to flow quite nicely, as they seem to be at the pace and of the quality you naturally love – slow and sweet. People quite readily lean on you, and you’re happy to oblige them as long as you know they’re sincere. When you respond to others’ dilemmas right now, and quite expertly, you can also gain some insight into your own life. 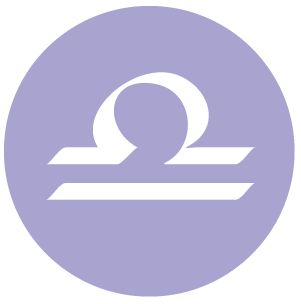 The Moon in your creative, romantic sector all day certainly helps to boost your mood, although this position can also temporarily thin your skin emotionally when it comes to feedback. 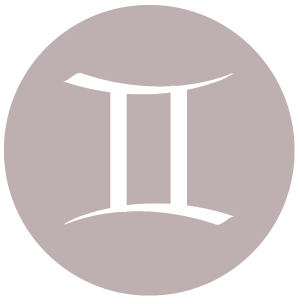 Others are thoroughly enjoying your company as you are not coming on too strong today, dear Gemini, but rather radiating a subtle air of competence. You are displaying more humble confidence, endearing yourself to others. Your ability to both listen and share helps put others at ease. Family matters are on the mind more than usual, or you are drawn to familiar people, things, and circumstances. Emotionally, you are less brave than you are usually, but when it comes to conversations, you are ready to entertain challenges and you are practically fearless when it comes to the topics you’re willing to explore today. There is special comfort with your words today, and conversations can be quite wonderful as a result, dear Cancer. People may be hanging on your words or particularly interested in what you have to say. You might teach, guide, or instruct others now, whether this is done informally or not. Your perspective is unique and appreciated now. You are able to envision solutions and to develop strategies for dealing with problems or for achieving your long-term goals. This is a strong day for socializing, connecting, sharing, and publishing or promoting. There can be a stronger interest in, but not necessarily a lot of objectivity, your financial state today, dear Leo. Financial matters and concerns are on your mind, but you’re also prone to worry about issues of security and comfort now. Help can come from behind the scenes, or anonymously today, or it can be through an illuminating conversation. You are looking at past matters in a new light, as you are more able to see and understand human weakness, which gives you a more compassionate outlook. There might also be helpful and even healing interactions with family or close loved ones today. 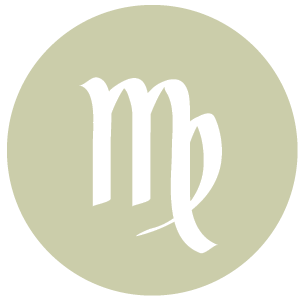 This is a fine day for making repairs in a relationship and connecting more deeply with a partner or special friend, dear Virgo. You have a chance to prove your commitment, and a special person in your life may be more willing than usual to share deeper feelings with you. You may be recognized for your competence and focus on the job as well now. 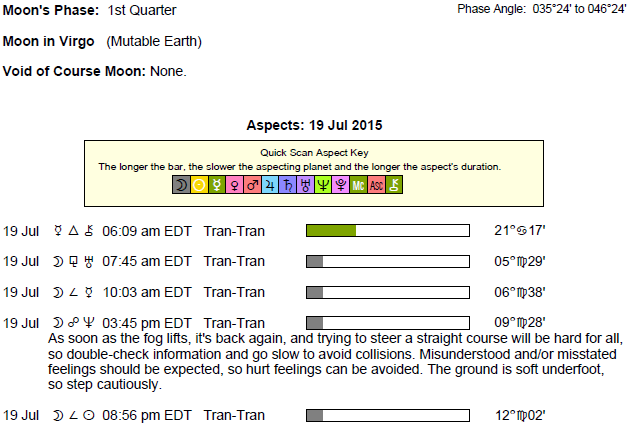 The Moon is in your sign all day, pulling up emotions that you may have put on a shelf in recent times. This can come in as a flood, but with careful management, you can learn a lot about what’s been driving your behavior. 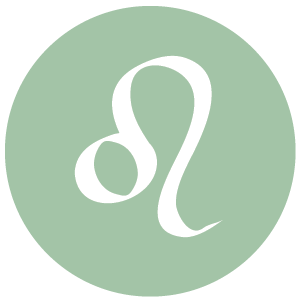 You are more in touch with your need for privacy and with your more personal and private feelings today, dear Libra. A little time taken for and by yourself can be especially helpful now. This is a time for self-honesty. Even so, friends have something to show you. Quiet lessons can be learned now, so while you should honor your need for time to get in touch with your innermost feelings, don’t turn off your phone either. Balance your private and social lives today. Conversations about work matters can also be helpful, and health news could be supportive as well. 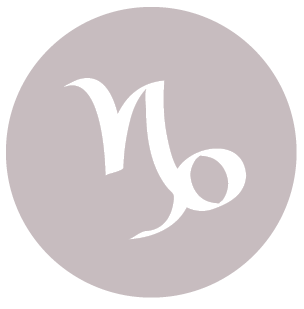 This can be a very strong day for creative or romantic endeavors that can benefit from commitment, depth, and focus, dear Scorpio. While you are forward-looking emotionally speaking at the moment, you can quite easily tap into and draw upon emotions from the past and apply them to whatever you are doing now with nice results. Conversations can be both kind and useful, as you are connecting on many different levels, including practical or physical levels as well as emotional ones. 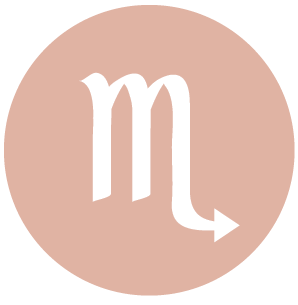 You can get a new perspective on a matter today, likely revolving around a creative project, romance, or educational interest, and this can help you out tremendously. 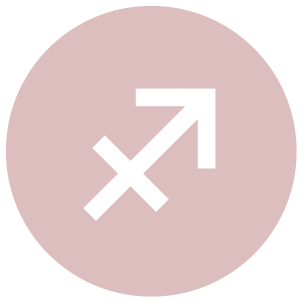 You are a little more emotionally invested in your performance, career matters, or what others are thinking of you today, dear Sagittarius. Even so, there is strong energy with you for issues taking place behind the scenes. Family interactions can be revealing, supportive, and insightful, or you might learn a little something about your own inner workings that is useful and that points you in a positive, happy direction. When it comes to your home environment or personal, psychological matters, your attitude is not necessarily in with the new, but certainly out with the old. 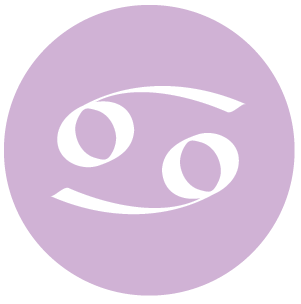 There is a freer energy to the day, dear Capricorn, but even so, the morning can bring a nice conversation or new insight into a relationship. Look for different ways of communicating if you’re not getting your message across. There are many ways to express yourself, and some are suited better for certain topics or situations. News, advice, or insights can point you in a positive direction. This is a time for enjoying people’s company without issues with judgment or expectations. You are also experiencing a more adventurous, outgoing trend now. You could find that you’re solving other people’s problems today, dear Aquarius, which not only makes you feel good, it might even lead to solving one of your own. You’re a little more patient than usual today, taking the bad with the good, and also quite observant. You are truly taking the time to listen to people around you, and others appreciate this. Because you’re looking in places you usually would overlook on another day, you might find a lost item or the missing piece to a puzzle, or even a resource that you didn’t know was yours. This is a good day for making the most of what you have or own, whether this is a latent talent, knowledge, or a material good. A good day is in store for personal appeal. Having fun and being creative are the best ways for you to enjoy the day. 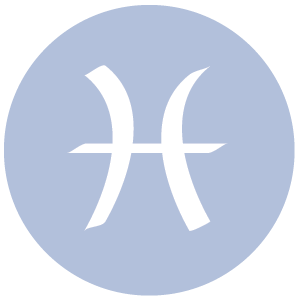 It’s a time for attracting what or who you want, dear Pisces, and subtly persuading others to follow your quiet lead. You have a unique or different view of life these days, and this trait is pronounced today, and also quite appreciated by others. This is a good time for turning problem areas around, to your own favor. You tend to go your own way when it comes to ideas these days, and if it stirs up a bit of controversy, so be it! This is the case because you are always careful with other people’s ideas and opinions. This is a wonderful time to teach others to uncover their own personal power or to listen to their intuition. 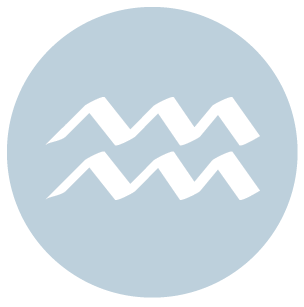 If Your Birthday is July 19th, If Today is Your Birthday full horoscope here. Listen to your heart. This is a beneficial time to purify your thoughts and body. This is a time when we express our love through practical means and gestures–running errands, doing detail work, or just being there. What we love, what we decide to buy and the types of entertainment we enjoy during this cycle are ruled by whether or not things make sense. 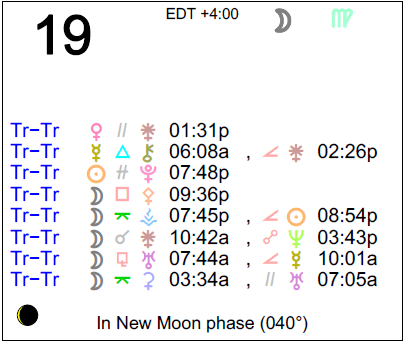 Sun 03° Taurus 56' 18"
Moon 05° Capricorn 46' 17"
Mercury 09° Aries 36' 28"